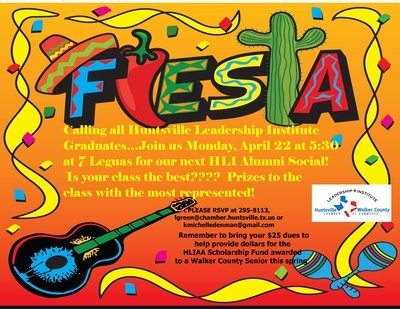 Are you an HLI alum? If so plan to join us on Monday, April 22 at 5:30 p.m. at 7 Leguas for our next social! Reconnect with classmates as well as other HLI graduates. Prizes will be awarded for the class with the most represented! Is your class the best? We will see! If you haven't joined yet, you can still do so. Cost is ONLY $25 AND your membership dues help fund scholarships for a Walker County Senior to attend college. Applications for the scholarship have been distributed to ALL Walker County schools. Deadline to apply is April 20th. If you are not receiving our emails PLEASE contact the chamber, 295-8113 or Karen Denman at kmichelledenman@gmail.com to update your contact info.